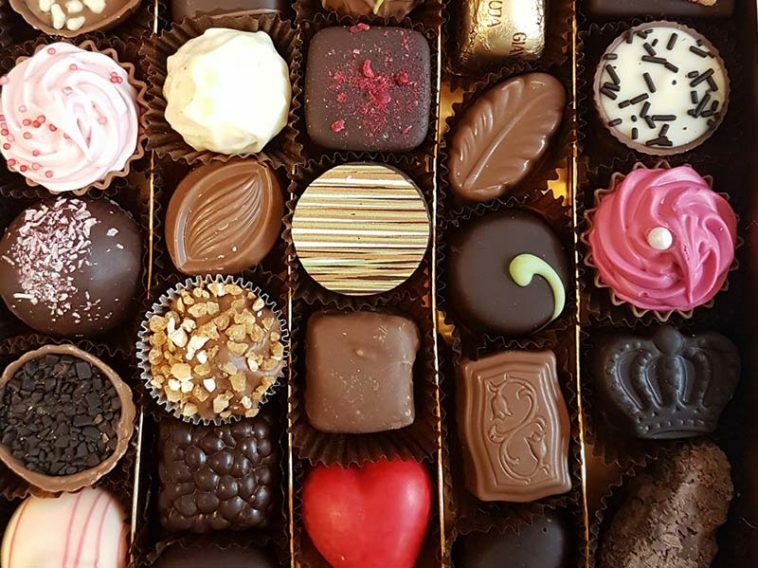 Chocolate on Valentine’s Day is a tradition that we all enjoy, but where does it come from? I did a little digging, and it turns out, this fabulous tradition originated in my favorite place on earth—England! By the 1840s, Valentine’s Day as a time to celebrate romantic love was widely adopted by most of the English-speaking world. Prim Victorians embraced the holiday by showering one another with rather lavish gifts. And this is where Richard Cadbury comes in. And yes, I am talking about the chocolate manufacturing company we all know and love today by their deep purple packaging. Cadbury actually owned that specific shade of purple for a time (Pantone 2685c). Cadbury had recently developed a new chocolate-making technique. They discovered how to extract pure cocoa butter from whole beans, resulting in a delicious drinking chocolate that most people had never tasted. To the company’s advantage, this process resulted in an excess amount of cocoa butter, which Cadbury used to produce what was then called “eating chocolate.” Richard saw a marketing prospect for the new chocolates and started selling them in boxes that he himself designed. 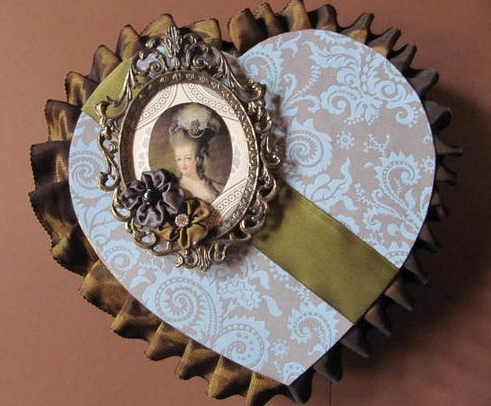 Heart-shaped boxes adored with flowers and images of cupid came next. Richard Cadbury didn’t actually patent the heart-shaped box, but it’s believed that he was the first to produce one. The boxes grew increasingly elaborate until the outbreak of World War II, when sugar was rationed and Valentine’s Day celebrations were scaled down. Victorian-era Cadbury boxes still exist and are now priceless family heirlooms, especially since Cadbury was the official cocoa and chocolate-maker for Queen Victoria. 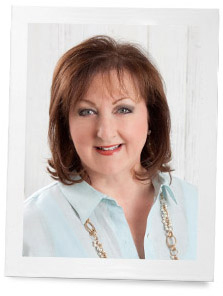 The first Royal Warrant was given to them by Her Majesty in 1854! It’s no wonder indulging in a box of chocolates feels like getting the royal treatment! 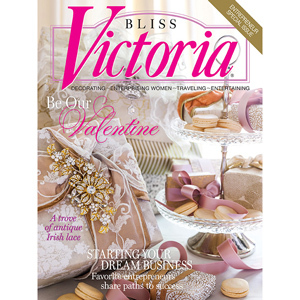 For more Victorian inspiration for your Valentine’s Day, click the issue below! I love vintage boxes almost as much as I love chocolate!! I also love vintage Valentine cards. Thank you for posting this information. I am also reminded how growing up, every Valentine’s Day, my father would buy me a heart shaped box filled with chocolates. I would then store all my Valentine cards in there. They were not vintage or particularly unique boxes, but they were special because they were from my dad. I just love vintage things (and, of course I love chocolate). I have an old Louis Sherry tin candy box that I got from my grandmother. It has seen many, many days, but it is a nice box. It has a hinged lid and is double layered , and, it looks really cute on my tea trolley! How fun to read the history of Cadbury Valentines boxes. Thank you for all of your lovely and informative posts. I have the great joy of living in Ponchatoula, Louisiana which is the home of Elmer’s candy company, a Southern Classic. Every year we relish the freshest chocolates made in the factory just off Pine street. The red beribboned heart boxes start appearing all over town. Thanks for sharing this slice of history. What a gorgeous box! Absolute Stunning! Thanks for sharing.